Ben Morgan, left, takes on Jason Hewitt. Pictures Pete Best/Sheffield Steeldogs/Hull Pirates. 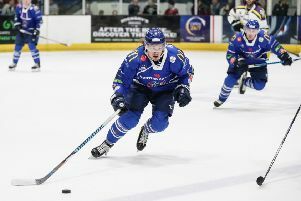 HULL PIRATES have been chasing Sheffield Steeldogs almost all season in the Yorkshire rivals’ long-running battle to land the NIHL Moralee Conference title. Then, on Wednesday, Hull saw themselves go top of the standings courtesy of a dominant 6-3 win at third-placed Telford Tigers. It means this weekend, the final one of the regular season, leaves them in a winner-takes-all double-header with Sheffield. A win at Ice Sheffield on Saturday night will see Hull clinch the title. Defeat means the title will go down to the wire when the two resume hostilities in East Yorkshire on Sunday evening. It could not have been planned any better. Jason Hewitt, the Pirates’ player-coach, admitted he has long had one eye on this coming weekend as the time when all will be decided, but believes his players are well-equipped to deal with whatever comes their way. “Both teams were going to be competitive at this level, so I think everybody on both sides were hoping it would come down to this weekend and it has done,” said Hewitt. Previously this season, the eight games to take place between the two - only two of which have been in the league - have often been tight affairs. Overall, Hull edge the head-to-head with five wins, although they found themselves coming off second-best against Ben Morgan’s side in the National Cup. Hewitt knows opposite number Morgan well, partly based on the two playing alongside one another for one season at Steelers under Dave Matsos in 2009-10. Both are rookie player-coaches who have been thrown in at the deep end, meaning they have had to learn on the job quickly. And while there may often be bad blood between the two clubs whenever they meet, Hewitt says he has nothing but respect for the job his fellow coach has done across the other side of the county. “I’ve known Ben a long time and I’ve got a lot of respect for him,” said Hewitt. “He plays hard and he puts his body on the line - he’s done a fantastic job down there. “He has them well-drilled and has them playing his way. I have my team playing my way. Morgan, too, hoped the final weekend with Hull would prove to be season-defining. “I had a funny feeling it would come down to this final weekend and I am glad it has in a way,” said Morgan, whose chief concern is making sure the title race continues through until the second game in Hull on Sunday.